Native to the northern Amazon and Central America, cacao, Theobroma cacao, was used as long as 2000 years ago by Mesoamericans as special drink during ceremonies. In fact, the latin name Theobroma means "drink of the gods". 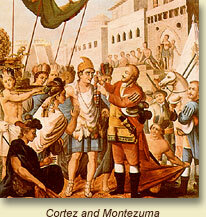 Columbus brought back some cacao beans and presented them to the Spanish monarchs. However, they were largely overlooked until Cortés met Montezuma, the Aztec king, and found him using chocolate regularly. Cortés saw the potential of cocoa and the drink soon became popular among the gentry of Europe. For more on the history of chocolate, see the articles, Wikipedia, Chocolate and Athena Review, A Brief History of Chocolate. The rising demand for chocolate in Europe led to the expansion of cacao production throughout the tropics, especially in the Bahia region of Brazil. This expansion was partly responsible for the destruction of the Atlantic Coast rainforests of Brazil. In the 19th century, this production made its way to Africa. encouragement of the Portuguese Baron of Agua Ize, the cultivation of cocoa passed from Principe on the neighbouring island of Sao Thome, and from there to the African continent. In Ghana, the members of the Basle Mission promoted it successfully. Surprisingly quickly, the many small and medium farmers stripped the rainfoests, turning West Africa ultimately into the largest producing region. Now, Cote d'Ivoir (Ivory Coast) is the largest producer in the world, accounting for over 40% of global production. Ghana is the next largest producer, with Nigeria, Cameroon, Indonesia, Malaysia and Brazil also producing large amounts.